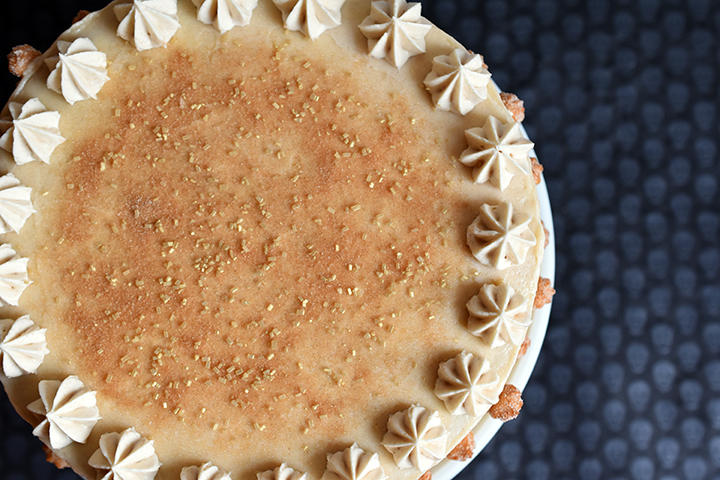 This impressive layer cake is reminiscent of a snicker-doodle cookie with Latin flare. If you don’t know what a churro is… man, are you missing out! Churros are a fried dough snack/dessert (a choux pastry) in stick form. Choux pastry is a light pastry dough that is used to make croquembouches, eclairs, or even beignets. The recipe for this pastry dough is basic. It contains butter, water, sugar, flour, and eggs. Churros are made by frying the choux pastry. Once fried they are sugared, and usually served with a thin chocolate sauce for dipping. Here in the U.S. they are just rolled in a cinnamon sugar and served at fairs. With this cake, we took the cinnamon and sugar application, and we adapted our Whipped Vanilla Frosting to create a Whipped Cinnamon Vanilla Frosting. We did this by adding 1 teaspoon of cinnamon and using vanilla extract instead of vanilla bean paste. Something of note: we used only one batch to decorate the cake in this post. However, if you like a lot of frosting, we suggest making a double batch so that you can elaborately decorate this cake with icing, inside and out! 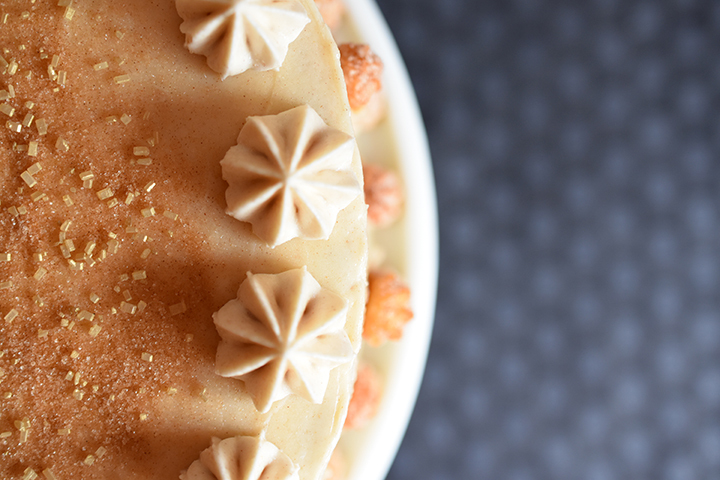 Now on to the cake… this cake is made with our own signature brown butter – brown sugar cake base. If you don’t know how to brown butter check out this link or this video. Also, if this is going to be your first time browning butter, don’t splurge on the good European butter, you will most likely burn it on the first attempt. Don’t worry if this is the case, after a couple tries you will get the feel for it and then you can upgrade to the expensive butter, which is generally creamier with less water content. This cake is perfect for preparing ahead of time. We recommend making the brown butter a day ahead. Once brown, transfer the butter to a heat safe bowl and leave it covered on the counter for a day before using. If you are short on time, or it’s the middle of summer and you don’t have air conditioning, you can place it in the fridge, or freezer, after letting it cool awhile on the counter to expedite the cooling process. However, if baking the same day make sure you don’t forget about it, or else it will be as solid as a rock. If this is the case, remove it from the fridge and leave it out on the counter to come to room temperature. The brown butter needs to be pliable so that you can cream it easily with the sugar. We decorated this cake with actual churros using this churro recipe, which was delightful. We used a star decorating tip and a pastry bag to pipe the dough into the hot oil. 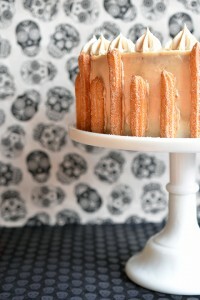 Once rolled in sugar and cooled we got creative with the churros around the edges of the cake. 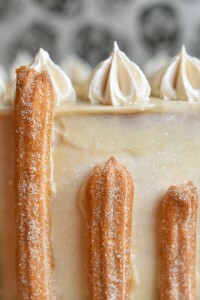 If using churros to decorate, be sure to decorate right before serving, or within a few hours of serving. The churros will lose their crispness being stuck to the buttercream. We also dusted the top of the cake with a cinnamon sugar blend – feel free to give the whole cake this “churro treatment” instead of making the fried churros. This cake has a delightful crumb while being moist and tender, and the frosting is silky and luxurious. 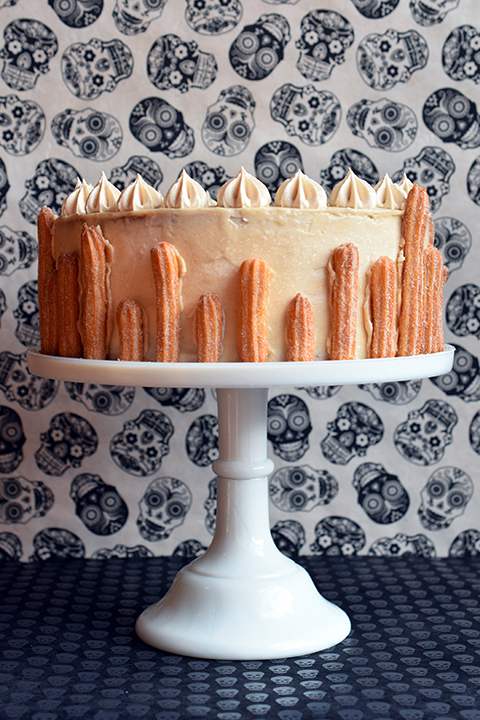 With the added churros, this is quite possibly one of our favorite layer cakes we have done thus far. This will make a two layer cake, each cake will be approximately 2-inch in height. Preheat oven to 350°F and prepare two 9" spring form cake pans with parchment on bottom and grease the sides with butter or baking spray. In a medium bowl, whisk together the flour, baking powder, salt, and cinnamon. Set aside. Cream together the brown butter, sugar, and brown sugar until it resembles wet sand. In a separate bowl whisk together the eggs, yolks, oil and vanilla. Then slowly add into the butter and sugar mixture, beating until creamy and smooth, scraping sides as necessary. Add the milk and dry ingredients alternately, starting and ending with the milk. Scrape down the sides of the bowl between each addition, until just combined. Example: milk, flour, scrape, milk, flour, scrape, milk, and scrape. Divide the batter between the two pans and bake at 350°F for 45-55 minutes. 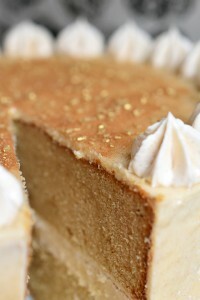 The cake is done when the top is golden brown and no longer giggling in the center, or until a toothpick inserted comes out clean.